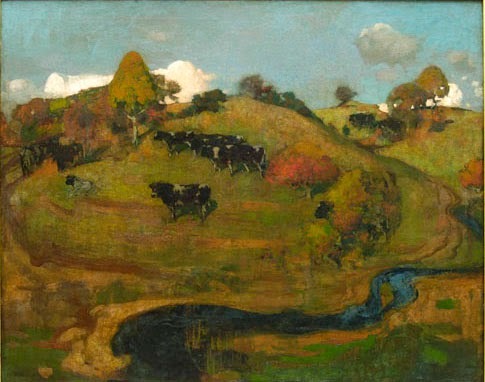 George Henry, Galloway Landscape, 1889. “There is scarcely a house of eminence in commerce or manufactures in the Kingdom which does not to some extent owe its success to Scottish prudence, perseverance and enterprise, there is not an industrial department in which there is not a large infusion of the Scottish element in management. Within a comparatively short period in the history of the nation, its population has more than trebled. It has led the way in agricultural improvements. Its real property has increased in even greater proportion.”1853 Glasgow Sentinel. Artists inspired by Corot: Murray, Macaulay Stevenson, Walton, Chalmers. The first Impressionist painting to be exhibited in Scotland: Glasgow 1888. Loan by Huth a London collector. Critics failed to mention the painting. In 1891 Glasgow artists were shown at the Royal Scottish Academy in an Impressionists Room. A flurry of letters arrived at the Scotsman arguing over the use of the name. When Galloway Landscape was shown in Berlin in 1893 it was said to resemble a mosaic: ‘the impression of nothing more nearly approaching nature than a geological map’. Billcliffe, R., 2008. The Glasgow Boys, London: Frances Lincoln. Fowle, F. et al., 2008. Impressionism & Scotland [exhibition, National Gallery Complex, Edinburgh, 19 July-12 October 2008, Kelvingrove Art Gallery and Museum, Glasgow, 31 October 2008-1st February 2009], Edinburgh: National Galleries of Scotland. Long, P. et al., 2005. The Scottish colourists, 1900-1930: F.C.B. Cadell, J.D. Fergusson, G.L. Hunter, S.J. Peploe, Edinburgh: Scottish National Gallery of Modern Art.